The breeze curled and twisted Ted Reid’s cigarette smoke like a belly dancer’s midriff. Stained from years of tobacco, grease, and depravity, the broken window blinds did little to hide the flashing red and blue neon CHARCOAL STEAKS sign from the bar across the street. Ted Reid jumped. Relieved to discover the noise source a mouse, his heart didn’t have a chance to regain normalcy before a fist pounded on the thin door. The flashing neon reflected off Reid’s pale face. “It’s open,” he said. Surprised, the cop tried the doorknob and it turned. “Well look at you Reid. Your face looks like Old Glory. Very patriotic.” He laughed, but no humor showed in his dark eyes. More laughter. “Know? Know that Max Kotler is dead? Know that I got called on my beat to investigate a murder? Know that you can’t handle a simple thing like shaking down a helpless coin dealer without killing him? Know that you created a real mess for me here? You want to know what I know? I know you got to explain things and make it fast.” Officer Sinclair spun his head around the room. “You got anything to drink in this dump?” the cop asked. Sinclair walked toward Reid. “Don’t lie to me. Your life ain’t worth one of them 2-cent pieces Kotler displays in them showcases. Face it, you botched the job, put a knife in Kotler and took off with those silver dollars. I want them and now!” Spittle from Sinclair’s thin mouth showered Reid. Reid’s mouth became a temporary cannon, part cough, part belch exploded. “What the hell you do that for?” he asked. Reid started to say something else but stopped. He needed to figure a way to rid himself of Sinclair. The dirty copper busted him for petty robbery nearly two years to the day and instead of arresting him, Sinclair extorted from him. Ever since Reid had been forced to pull off small neighborhood robberies, fence the merchandise and give the proceeds to the crooked cop. He hated it, he wanted out but felt cornered. An old story, Reid had a wife and a job, a salesman with an ice truck route. He made a decent living but made the mistake of other foolish men. In Reid’s case, it involved a redhead in a three-story walkup apartment in mid-August. He didn’t collect cash for an ice delivery, lost his job and his wife in the same week and was introduced to Officer Terry Sinclair after stealing a case of whiskey. The two drank the stolen booze. Stolen rocks from an ice truck belonging to Reid’s former employer cooled the drinks. Ironically, Sinclair was right. Reid didn’t leave the coin dealer’s office empty-handed. He had told the truth about the silver dollars. He saw them on Kotler’s desk, but he didn’t take them. Kotler, bleeding badly, was still alive when Reid came to rob him, but barely. The single knife wound entered his chest and blood continued spreading across the coin dealer’s white shirt. A splatter of crimson seeped into the green carpet giving the woolen fabric a yellow appearance. Without thinking, Reid’s “No” blurted from his mouth. Both Reid and Sinclair’s heads turned as the hotel room door swung open. Detective Ben Brosnan scowled. Two men followed him. One a well-dressed man, tailored suit and starched white shirt. Tall and thin he had the hands and fingers of a piano player. An expensive looking gold watch complemented gold horseshoe-shaped cufflinks. His thin black tie contrasted with thick black-framed eyeglasses. The second man looked familiar to Sinclair. He sported blonde hair combed straight back accentuating a pointy nose. His checkered sports jacket clashed with his pants. The jacket was too long and needed pressing. Brosnan spoke, “Officer Sinclair, this is Peter Wooley.” He pointed to the first man. “He’s an inspector from the United States Treasury Department.” Without changing facial expression, Wooley nodded. “And I’m Matt Mitchell. Internal affairs” offered the other. Sinclair winced. “What’s going on here Sinclair?” asked Detective Brosnan. “I didn’t do it!” shot back Reid. “Were you in Mr. Kotler’s office today?” asked the straight-faced Wooley. “And the reason for your visit, Mr. Reid?” Wooley adjusted his glasses. Reid hesitated. He glanced over toward Sinclair. The cop visibly stiffened. “Are you a collector?” asked the Treasury man. Reid couldn’t believe his eyes. He knew Sinclair to be unstable and dangerous. At the moment the corrupt cop pointed his gun away from Reid, Reid jumped him. The two tumbled, rolled around on the stale carpet before Sinclair freed his gun hand. BANG! A shot went off. A hole in the wall inches from the open window appeared. Everyone froze. Momentary silence came to end when Detective Brosnan yelled, “Stop!” The detective pulled Reid off Sinclair and applied handcuffs to the cop. Terry Sinclair spit. Reid thought of the 1943 penny. Burnt once by a law enforcement officer, he became hesitant. “I’m sure. Nothing,” he lied. The trio, Ted Reid, Detective Brosnan, and U.S. Treasury Agent Peter Wooley got as far as the Galaxy building lobby. A uniformed officer met them. “What’re you doing here Hal?” asked Brosnan. “Someone found a body. Elevator operator. Appears to be strangulation. Poor guy. He’s worked here for years, knew everyone, never had a bad thing to say about anyone. Who’d want to do him in?” asked the policeman. “Someone who didn’t want to be identified,” answered a solemn Wooley. He sneered at Reid. “Let’s take another look at Kotler’s office.” The three men rode the elevator, Detective Brosnan at the controls. A sickening feeling revisited Ted Reid. The office was pretty much the same as it had been when he discovered Kotler on the ground, knife in his chest. The body had been removed, but the office had not been cleaned up or straightened out. Reid, ready to come clean about the 1943 penny and Kotler’s cryptic Yes, No response, stopped himself as Wooley spoke. “What’s this all about?” asked a bewildered Brosnan. “I’ll take that coin,” said Wooley, extending an open-palmed left hand while pointing the pistol at Reid and Brosnan with his right. The smirk on Wooley’s face blossomed. “Not just any penny you fool. In case you haven’t noticed, there’s a war going on. Copper is at a premium. 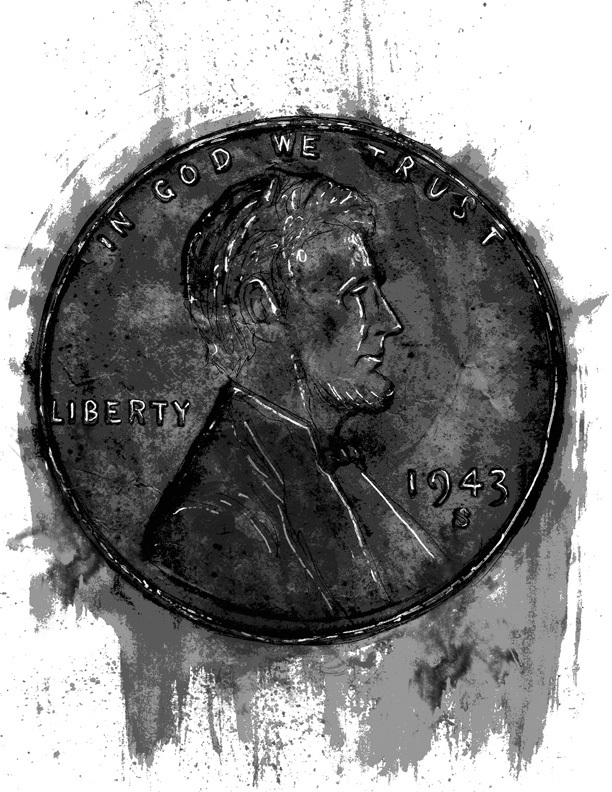 All the 1943-minted Lincoln pennies are being made with zinc plated steel, not copper. But, a few copper planchets were still in the presses from 1942 when the Philadelphia mint began producing the pennies. It was my job to make certain the presses were cleared of copper prior to striking the 1943 coins. If a coin like this became known, I’d get fired. I traced one to a roll of pennies that was distributed to The First National Bank of Philadelphia on Broad Street. When I inquired about it, I was told that the coin dealer Max Kotler had received a shipment of rolled coins of all denominations. I figured correctly this copper penny was contained in one of the rolls. So, not only do I save my job, but I also get a priceless collectible coin as a bonus. Hand it over Mr. Reid.” The gun pointed directly at Reid. That explained why Kotler had said, Yes. No, when Ted naively stated, it’s just a new penny, thought Reid. The door flung open. Hal, the uniformed patrolman from the lobby stood at the door. Peter Wooley turned and fired. Before his lifeless body hit the floor, Hal removed his weapon and got off a single shot. It was enough. Wooley fell against a glass display case, shattering it and his eyeglasses. Blood from the fatal gunshot mingled with blood streaming from the numerous glass shard cuts. “Why not?” answered Brosnan. “What’re your plans for this penny?” he asked, handing it back to Reid. Marshall Ernie Farrar had his hands full with a missing-man case and a Wells Fargo stage-coach robbery. Someone was trying to cover his tracks, but it won’t be who you suspect.